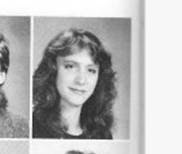 This a picture of me from my high school yearbook. Despite what I see in the mirror, or reflected in other people's eyes, frequently this is what I see in my own mind's eye when I think of "me". Part of me is stuck there in time - awkward, anxious, and (what I thought at the time) unpopular, inept. Despite how far I've come, she still lives in me. Her fears, her troubles. Sometimes I bring her to the milonga - or rather she brings me. My confidence wanes. Instead of being a grown woman at a milonga, I'm a 17 year old at prom. I can't seem to connect to people with her in the way. She's too strong an influence at those insecure times for me to just push her out of my mind. I have to deal with her. All of that brings to mind a meme that's going around right now on Facebook and other places. What would you tell your teenage (I think 16 is the age given in the survey/meme) self? If you could go back in time and sit down with yourself at that age - what would you tell them about the future - about your future? So here it is. Me talking to myself . . . It seems like such a bad time right now, such a dark time. I know it seems like none of this going to get better and it's your fault. But it's not your fault, and it does get better. It isn't easy, the road ahead. But there are so many people coming to help you on the road you're traveling - and people that need you, too. You're going to meet people from all over the world. You're going to be a writer and an artist and do so many of things you dream about - and some things you can't even imagine right now. The world is so amazing where I am. New troubles of course - different challenges, some of them huge. But so many amazing things I don't even know where to begin to tell you. In the future these people that you think are so much better than you, will tell you that you made a difference for them. Listen to McArthur - he's right about the things you're going to be able to accomplish. Don't lose track of your friends - you'll kick your self later. Don't get lost in all of this bad stuff going on right now. You're valued and you're loved, even if some of the people can't tell you that yet. Love is everything - love will save your life. It gets so much better than this . . .
And you won't believe this . .
. . . you're a dancer. abrazos y besos (you'll just have to look that up) from the future you . . . I so KNOW what you're talking about: my version of this is "Little Jimmy", the dorky kid with buck teeth and glasses and zero belief in myself. And, he's still shows up, of course, at the least convenient moments. Then, I get to beat myself up with the you're-supposed-to-have-outgrown-this-thirty-or-forty-years-ago whip. Yeuch. But, it has gotten a lot better lately. Thanks for sharing that part of you that's really deep. "But, it has gotten a lot better lately." Several tango dancers have told me that dancing tango made them make peace with themselves over things like that - past and present.